Florida Is A Verb: Streetcar Apocrypha: Tampa once had one of the nation’s best transit systems. What happened? These arguments ignore one important detail, that light rail did work in Tampa. Light rail worked in Tampa for over sixty years. 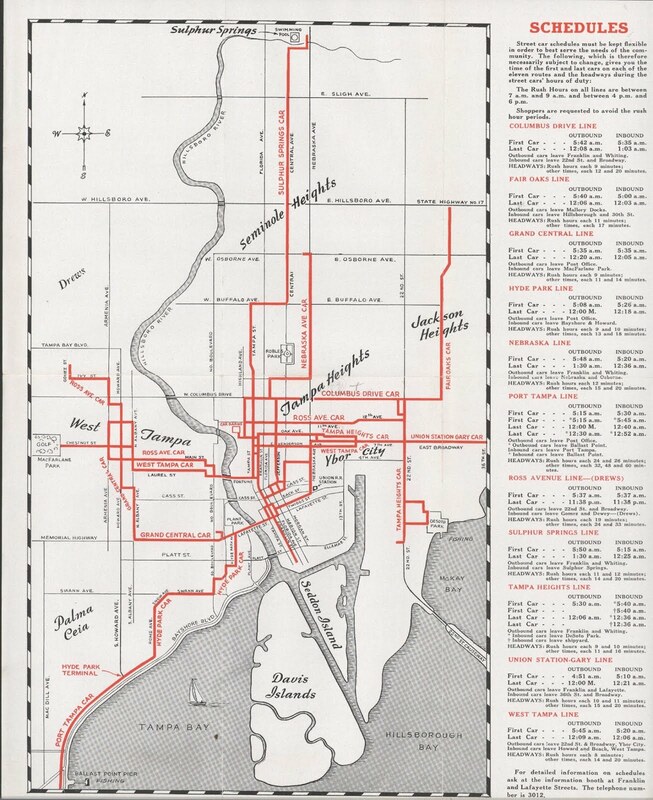 Exhibit A: Tampa Streetcar Map c.1940's. Tampa was a tiny backwater built around the frontier military outpost of Fort Brooke. 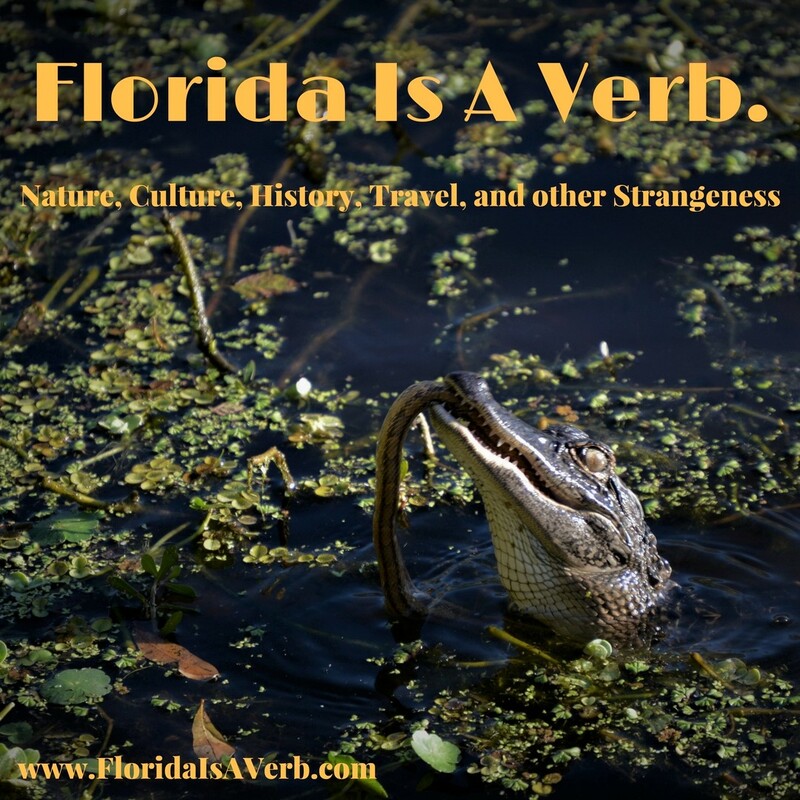 It was the combination of Henry Plant’s Railroad and Don Vincente Ybor’s cigar factories that caused a massive population boom in the mid-1880’s- seemingly overnight, Tampa grew from a town of less than 800 people, to a bustling city of over 16,000. Tampa’s first streetcar line was established in 1885, a steam-powered miniature railroad that ran from Port Tampa, through Ybor City and to Downtown. 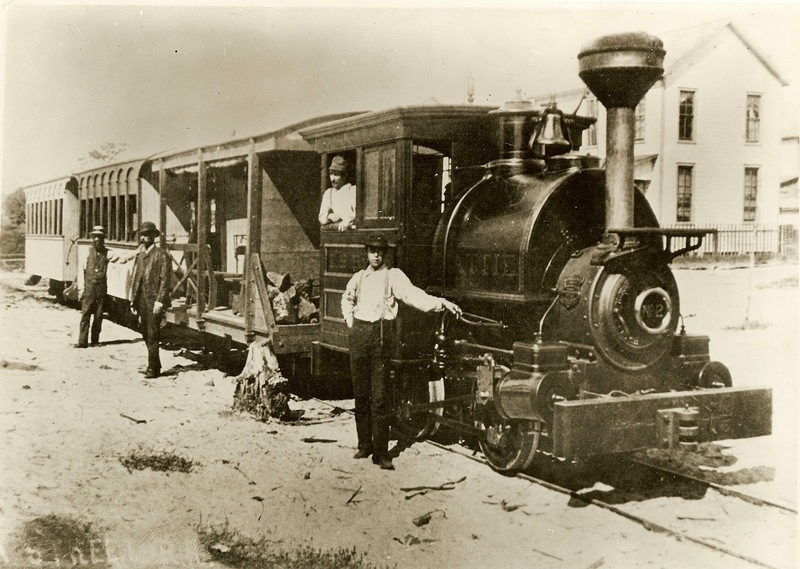 Tampa's first Streetcar was powered by a wood burning steam engine. By 1893, Tampa had two competing electric streetcar companies, the Tampa Street Railway and Power Company (which operated the original line), and the Consumers Electric Light and Power Company (Which operated a several newer lines). 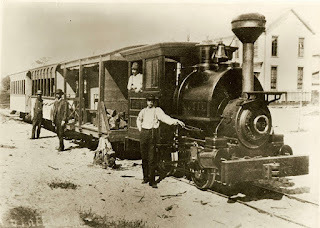 A rate war between the two drove the Tampa Street Railway out of business, and allowed Consumers Electric Light and Power to take over the streetcar business in Tampa- operating over 21 miles of electric streetcar track throughout most of the 1890’s. In 1897, Consumers Electric built a new hydroelectric dam (the first in Florida’s history) on the Hillsborough River near Temple Terrace. 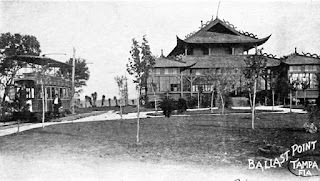 Ranchers in the area North of the dam complained that it was flooding of pasture land, and in 1898, the dam was blown up by dynamite in the middle of the night. No one was ever prosecuted for the incident, but it’s been long suspected that a conspiracy of cattle ranchers was responsible for the attack. Consumers Electric never recovered and sold off everything they owned to the newly-formed Tampa Electric Company (TECO). A recreational trolley with open-air roof seating, early 1900's. Between 1900 and 1920, TECO expanded and modernized the streetcar system, and built recreational streetcar lines that took riders to their series of ‘Electrical Parks.’ Ballast Point Park, The Sulphur Springs Pool, MacFarlane Park, and DeSoto Park were all originally established as streetcar destinations, and some of these recreational lines had special trolleys with rooftop open-air roof seating for sight-seeing. Ballast Point Park, one of TECO's 'Electrical Park' destinations. 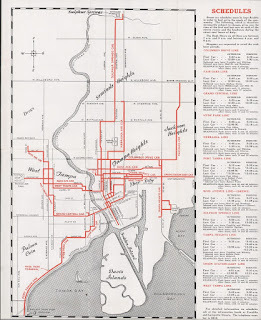 The 20’s, 30’s, and 40’s can be considered the heyday of the Tampa trolley system. It was convenient, inexpensive, reliable. At its height in the 1920’s, TECO operated 130 streetcars over 50 miles of track, had 11 major routes and collected an estimated 22 million fares annually. It was the largest electric trolley system in Florida, and one of the largest anywhere in the world. Though ridership waned somewhat during the Great Depression, it boomed again in the 1940’s due to World War II-era gasoline rationing. By the end of the 40’s, however, the whole thing was gone. A Clipping from the Tampa Tribune on the end of Tampa's streetcar system. straight answer on what exactly happened- different sources give different stories, and while I may have my own suspicions, it’s hard to say what exactly is factual. 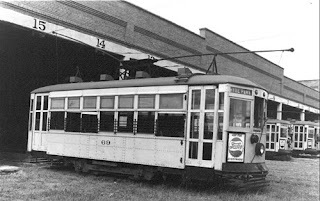 We know that Tampa’s last streetcar ride ended at 2:15 in the morning on August 4, 1946, and TECO sold off many of the cars (mainly to cities in South America), the remaining cars had their trucks and wheels stripped for scrap, some of the carriages found new lives as tool sheds or restaurant décor (there was one in the Spaghetti Warehouse in Ybor- as far as I know it’s still down in that basement room. I’m also pretty sure I saw one being used as a DJ booth at a warehouse rave about 15 years ago) the rest were piled in an empty lot and burned. Retired streetcars await their fate in a TECO garage, 1947. We know what happened, but what’s unclear is why. The official version, from TECO’s web site, is just that “postwar America embraced the family car and moved to the suburbs in large numbers.” One version says that TECO wanted to sell the streetcars to fund a new power plant and expand their business of providing electricity to homes. Another says it was the city that felt the streetcar system was worth more in pieces than intact. The version I’ve heard most often, however, is that Tampa, like many other cities, fell victim to the rumored General Motors Streetcar Conspiracy. I’ve been told this many times, by many people, I can’t find any proof of it, but it’s an important part of Tampa apocrypha, something that’s gone around as a rumor, and drifted into legend over the years. The story is that on the day the Tampa City Council voted unanimously to replace the streetcar system with General Motors buses, each member of the council drove home from City Hall in a brand new 1946 General Motors Cadillac. This is likely an urban myth, but something about the story, and how often it has been told over the years, illustrates what the death of Tampa’s Streetcar system felt like-- how it felt like a sellout- like a betrayal. In the following decades, the Interstates carved up the city, and destroyed whole neighborhoods; including the historic Black business district of Central Avenue, which was razed to build what we affectionately call Malfunction Junction (I’ll write a full article on this soon). The city center was neglected as affluent residents flocked to the suburbs, and the consensus on transit became to constantly build more, and wider, highways. Light rail did work in Tampa, people with fewer resources, and much less advanced technology were able to build a safe, convenient and inexpensive transit system that served the city effectively for over half a century. We should be able to do at least as well.